Citrine Initial Necklace or Bracelet for those born in November. November is another greedy month for birthstones; it has two, Yellow Topaz and Citrine. Oh so spoilt for choice you November babies. Topaz is said to be a stone of truth and happiness. The name Topaz is said to be of Sanskrit origin and the word tapaz, meaning “fire.” The flickers of the open fire reminiscent of the flashes of yellow hues in the November birthstone. Citrine is a transparent, yellow variety of Quartz, which ranges in colour from pale to golden yellow, to a darkened honey brown. It can often contain rainbow or sparkle inclusions, giving it depth as well as texture. The name Citrine comes from the French word from lemon – citron, fitting given the yellow tones of this precious gemstone. The history of the Citrine gemstone stretches as far back as Greece in 300BC, where it was used as a gem in jewellery making. Citrine was also extremely popular in Victorian Britain, with many ornate and expensive pieces commissioned to include dazzling citrine centrepieces. It’s yellow hues having a great warming effect on any ornate jewellery. Citrine Initial Necklace or Bracelet embellished with the stone of imagination, which can unleash inner creativity and expression. Due to its golden colouring, it is often considered to be energising, like the rays of the sun. Such golden tones and symbolism makes the Citrine Initial Jewellery a special gift for that little ray of sunshine in your life. 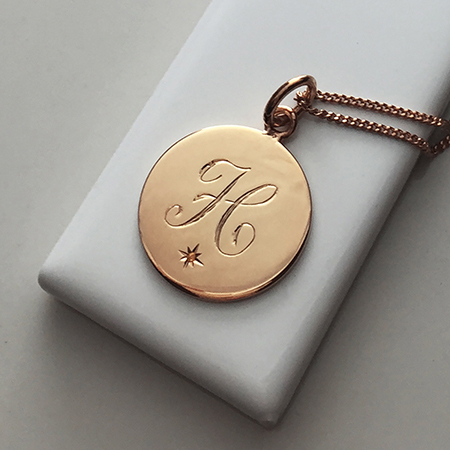 A personalised gift that she is sure to treasure forever. I must say what excellent customer service you provide. I am extremely happy with the Golden ‘Swallow’ Necklaces, thank you – absolutely love them. The packaging was very sweet too.